I’ve been working with some really good teachers in my district on instructional design as part of our 21st Century Learning grant project. Our emphasis has been on using backwards design, and, following the wisdom of Grant Wiggins, one of our goals has been to design learning for meaning-making and transfer. The part that our teachers have struggled with the most is transfer. 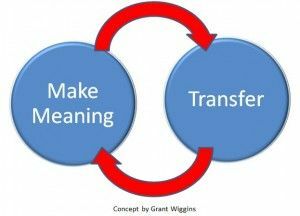 Transfer is the ability to use the understandings, knowledge and skills the students have learned in a given unit (connected to what they already know and can do) to solve a new problem or create something authentic and meaningful. The task might be entirely different from anything the students “practiced” in the course of their learning. The messier the problem is, the better. One way to design a transfer task is to imagine what someone in “the real world” might do with that knowledge and skill – what kind of work would they be doing? Then, build a plausible scenario where students can be in those roles, and/or make it real by having their final product, thinking, and ideas shared with an authentic audience. I think one reason this is so difficult is that teachers are struggling themselves with the age old question students ask, “Why do I need to know this?” They are having a hard time identifying themselves how the content transfers to the “real world.” For others, the concept of transfer is simply not understood. One way to think about transfer is through a common learning experience the majority of us have had: driving a car. If we were only taught about every little part that is in a vehicle and each driving law was only learned and memorized in isolation, would we actually be able to drive a car? Of course not – we need lots of time practicing and applying (transferring) the knowledge and skills learned to be able to pull it together – and be able to drive in in any kind of condition. And then – feedback is essential to improvement. In the driving scenario, that feedback might come from other students in the car, the instructor, or even other drivers on the road. Often, it comes from our own gut feeling (which might in fact be generated through non-verbal feedback and reactions around us). The same is true of sports, cooking, gardening – all require knowledge & skills that only improve with the opportunity to transfer that knowledge and skill to the actual “real world” task. We get feedback, and we try again. There was an interesting exchange on #edchat last week regarding whether or not the Common Core Standards allow room for creativity and innovation. My opinion? If you teach the standards in isolation, without ever giving students the opportunity to “pull it all together” through transfer and feedback, then probably not. But if you design learning for transfer of the content and standards to real-world authentic tasks as a primary goal for student learning and plan backwards from there, then yes – because the teacher designs the learning to include opportunities for students to practice creativity and innovation through the transfer task. Standards don’t prohibit teachers from using their own creativity to design learning that requires meaning making and transfer, but ironically, often teachers limit themselves (or feel limited by structures and/or authority) in pursuit of meeting the standards.